I could never get worked up about crepes. Crepes are these overly-thin pastries that, if you pour syrup on them, you mostly taste the syrup. But, you know, some guys who have the knack for making a good crepe can not only please customers, but if he plays his cards right, he can be a hit with the ladies. Just look at Claude Plamondon over here. All the ladies stare transfixed as Claude tosses a crepe high in the air. Hey, some guys have it, some don’t. 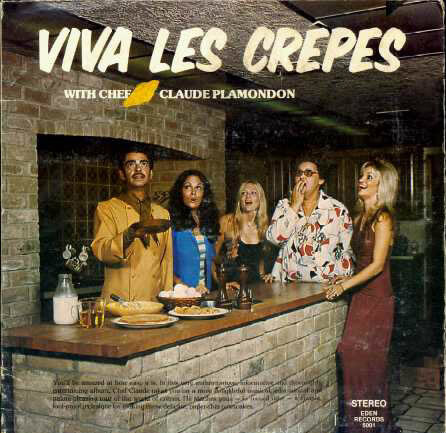 I don’t understand how Claude can fill a record album with the making of crepes, but then, hey, I’m not a chef. Plamondon currently resides in the small town of Roxton Pond, 40 miles east of Montreal as the crow flies, but south of the St. Lawrence River. Look at this nice steak. 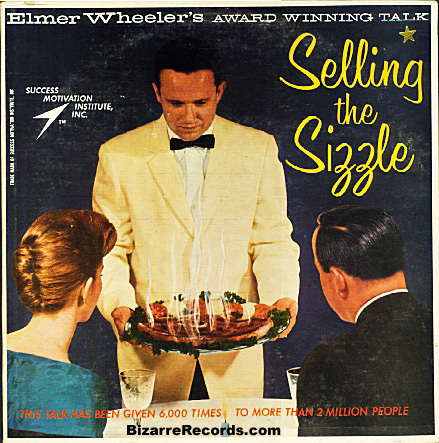 If Elmer Wheeler originated the concept of “selling the sizzle”, then this must have been one of the first recordings of that idea. Since then, if you hadn’t heard of Wheeler, you may have heard of the phrase, since it is now quite often quoted in business circles. I am not sure whether the clients, who have their backs to us, are going to eat it or just stare at it. And if the steak is in fact sizzling as much as the retouched photo suggests, isn’t the waiter going to burn his hands at some point? Wouldn’t they be burning already?